When the Internet was first commercialized and commonly utilized, men numerically dominated Internet use (Actman, 1995 and Johns, 1997). Over time, the population of Internet users has normalized and increasingly women are using the Internet at the same rate as men. This raises societal questions. Is social media conditioned to be more ‘female-dominated' due to the focus on social aspects, traditionally seen as more feminine? 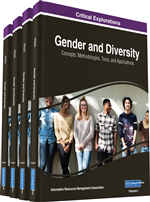 This introductory chapter explores the technology use of women. Taking a perspective of providing a background, first, the literature related to women and technology and the dominant theoretical underpinnings is discussed. Then the authors investigate conditioning of women in careers, lifestyles and general technology use. This discussion of the academic literature is then reinforced through an analysis of industry based data, to understand how women are utilizing technology. The chapter concludes with an agenda for further research into the use of technology by women. When the Internet was first commercialised and commonly utilised, men numerically dominated Internet use (Actman 1995; Johns 1997). Over time, the population of Internet users has normalised and increasingly women are using the Internet at the same rate as men. In fact, since social media has become commonly used, and smart phones have become de rigueur, increasingly women in developed countries are utilising technology in their careers and to manage their day-to-day interactions. This raises societal questions – have women been conditioned to believe that technology is male-oriented, and therefore not utilised it at the same rate at men? Is social media conditioned to be more ‘female-dominated’ due to the focus on social aspects, traditionally seen as more feminine? This introductory chapter explores the technology use of women. Taking a perspective of providing a background, first, we explore the literature related to women and technology and the dominant theoretical underpinnings. Then we explore conditioning of women in careers, lifestyles and general technology use. This discussion of the academic literature is then reinforced through an analysis of industry based data, to understand how women are utilising technology. The chapter concludes with an agenda for further research into the use of technology by women.